I'm a huge fan of Evernote. I use it to take notes, clip web articles and get organized. I recently found out about Springpad, which is similar to Evernote, but with some differences. Springpad is free, and is available via web app and for iPhone, iPad, and Android. 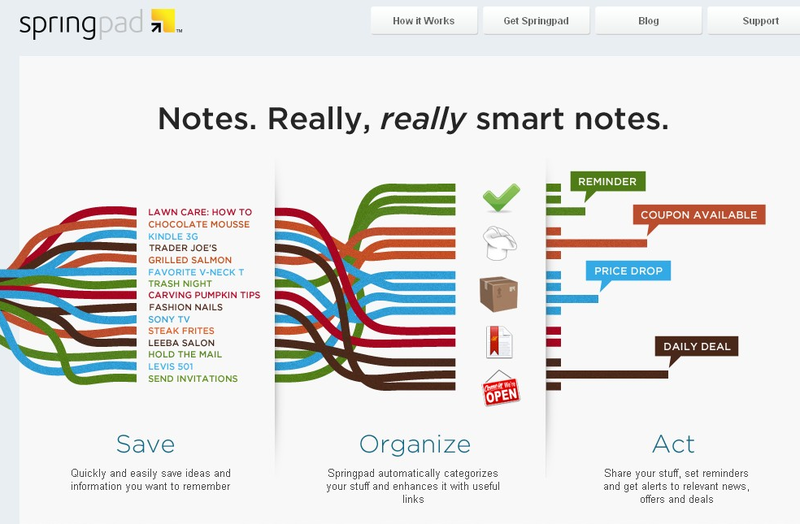 Springpad allows you to create and organize tasks in a different way than Evernote, and organizes your notes differently. You can take notes, clip web sites, create task lists, and more, just like in Evernote, but you can also import data from a bar code, search by location, and add photos. You can organize things by notebooks and tags like in Evernote, but Springpad also has "The Board" which is a digital cork board to help you organize the important things. Springpad also lets you post from it to Facebook, Twitter and email to share your data and notes and you can even set reminders and alerts for notes you've taken. Springpad is easy to set up and use and I see it as a worthwhile competitor or companion to Evernote. 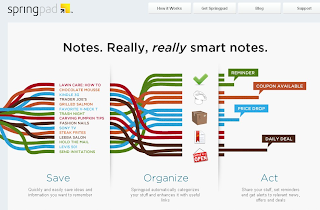 It is a great tool for students and teachers to take notes, organize information, and get themselves organized and efficient.